Rama-what? No really, what are the rules here? I admit my circle of friends and acquaintances at home has never included many muslims, that I’m aware of. Therefore it was surprising to me to learn that one of the pillars of Islam is the observance of Ramadan. The dates change every year, but it’s always 30 days. This year it’s Sept 24 to Oct 23. 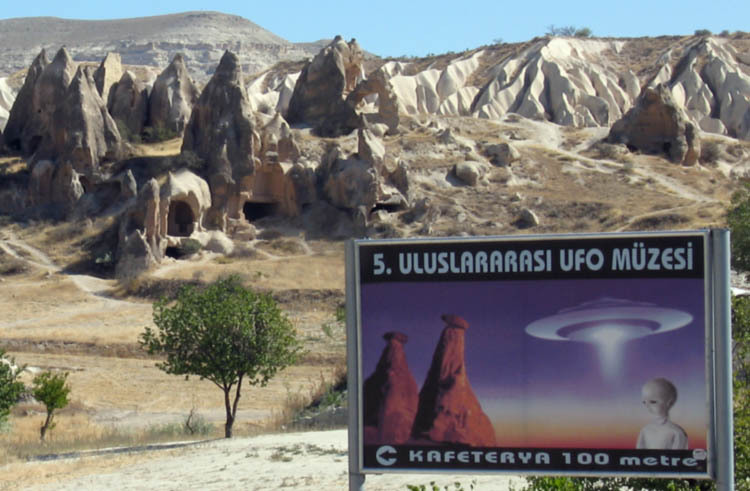 Lucky us we get to experience it while we’re traveling through Turkey, Jordan, and Egypt. What we’ve heard is that during this time good muslims cannot eat or drink ANYTHING from sunrise to sunset. This year that means from 6am to 7pm no bread, no tea, not even water, nothing means nothing. After sunset there are gorging parties all over town. Also, they must pray 5 times during the day, including at 4am, and all efforts are to be exerted to do so at a mosque. This not only scrambles a lot of public services like transportation and office hours, but also puts people in bad moods since they thirsty and starving all day. And they have to go cold turkey with alcohol because it is strictly forbidden during this month, more so than the rest of the year when some of the rules are more loosely interpreted. There are other particulars like the sacrifice of a goat, etc. that we haven’t been able to get all the particulars on. So we weren’t sure what to expect in Istanbul since it is very much a modern city with enormous western influences but is nonetheless muslim. In the morning my belly was already on empty so we walked around trying to spy if any non-tourist was eating or drinking. As it was a Sunday, their only day off, the streets were quiet. I was getting pretty desperate and ready to buy snacks to scarf in the hotel when we did catch some local looking peeps sipping in cafes. There was nothing that indicated that this was day was any different from the last. So on the first day of Ramadan my true love gave to me, a McDonald’s hamburger. Hence we yearned the sea to frock. To sail pass the land of Lycia. And lived jolly saint Nicholas. To nap, idle, and tan our hide. Four days thus sailed by. The Blue Cruise as it’s called sails across the southwestern Turkey coast from Olympos to Fethiye. In 4 days, 3 nights it goes the distance that it takes a bus one and a half hours to cover. And that’s pretty much the pace of life on the 78’ wooden gulet. Your day is your own and although there were 16 other passengers and 3 crew there is ample space to spread out and enjoy the peace. Each day the vessel would stop in a couple of locations to see the sites, stretch the legs, and have a swim. Three warm meals a day, plus a snack, were prepared by the cook who looked like a cheerful surf bum. He made all kinds of good stuff like stuffed peppers, French toast, and fish-head soup from the captain’s morning catch. The soup wasn’t much to look at because it stared right back, but it tasted good. The cabins were spacious doubles each with their own shower and head that flushed. The last night we opted to sleep under the skies on the deck. 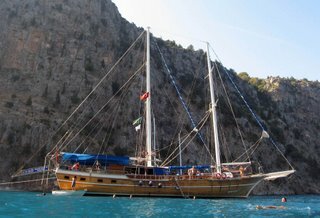 The gulet is really nicely set up for lounging with cushioned beds for laying out, canopies for the whities, and even a hammock at the bow. To break up our napping, Steve entertained with cliff jumping. We were very pleased with the quality and experience given the price was half what it would cost in the States. We would highly recommend doing this for anyone going to Turkey and looking to relax under the sun. Editor’s note: we had lunch in Demre, which is the home of one Saint Nicholas they claim as the inspiration for modern day Santa. No presents dropped through our porthole, though. Cappadocia is a region of central Turkey that is covered in bizzare rock formations, some of which are visually similar to Bryce Canyon in Utah. Millions of years ago, a bunch of soft tufa was covered by some hard lava. Once the lava cracked up, the tufa wore away much faster and the result are cones or cylinders of tufa protected by caps or mushrooms of lava. Atleast that’s what the geologists will have you believe, but the locals have another theory. They want to believe. What makes this area even more interesting is that the Hittites living here a few thousand years ago used all this soft stuff to carve themselves some homes and hiding places so the area is blanketed in three major types of sites: cool shaped rocks, rocks with homes or Christian churches carved into them, and underground cities carved into hills.To the modern tourist, it is a playground for hiking the valleys, climbing higher than you should to see frescoes in the churches, wandering through the remains of ancient apartment complexes and getting lost and dusty in dark winding caves. We stayed here 7 days in a town called Goreme and balanced a few big hiking and scootering days with some naptime. The first big hike day, we did some good off trail climbing through a couple canyons, up through vineyards and pumpkin patches on the plateaus and down through a valley of absolutely phenomenal fun. 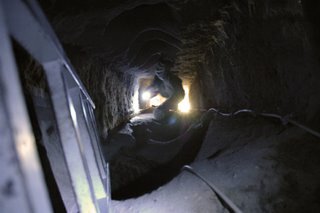 The undergroud cities are possibly even more impressive than the sites up top. 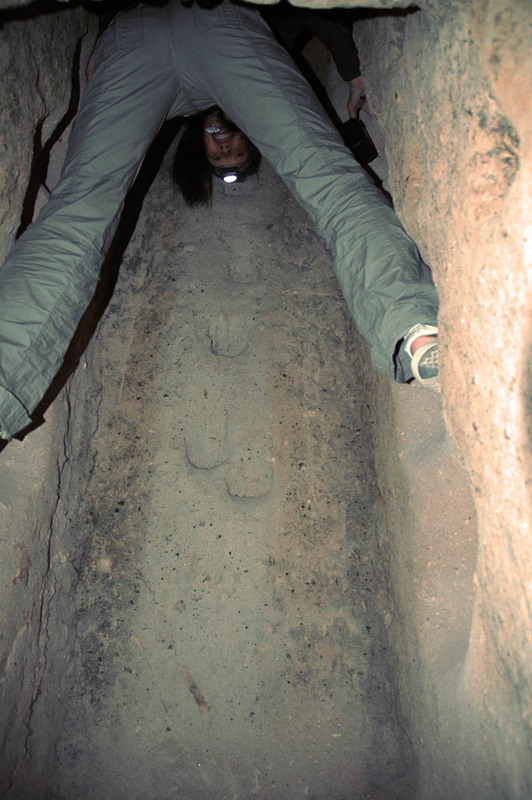 The locals claim there are hundreds of cities of varying size and excavation in the area. 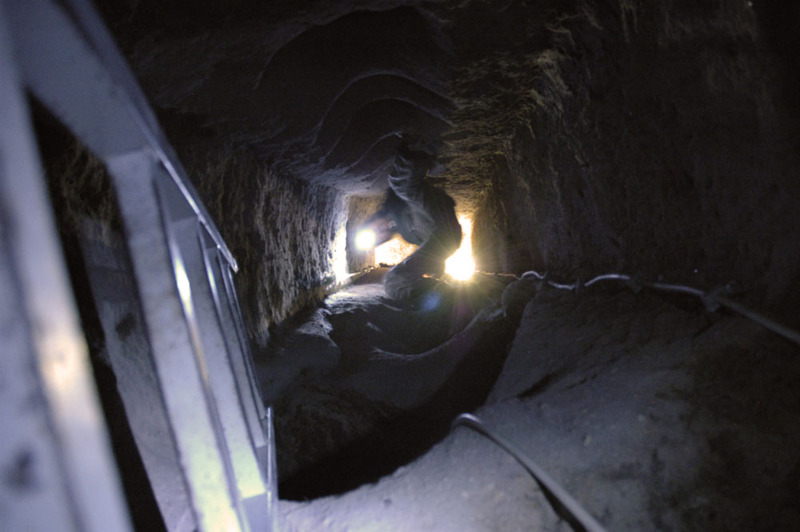 The largest we saw claimed to be excavated to 8 levels below ground with some 5000 rooms discovered. 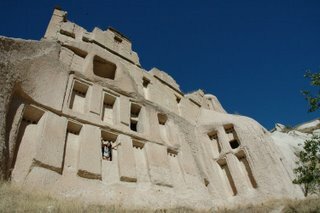 This first city at Kaymakli is very clean and setup for tourists. There’s even lighting run through most of the rooms. 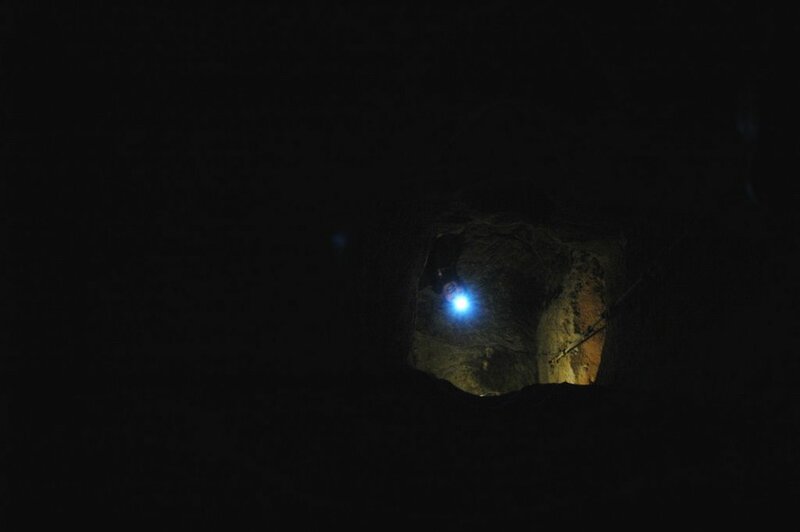 Of c ourse, we spent a fair amount of time off the beaten path with only our headlamps for light. I think most impressive is the little stuff. 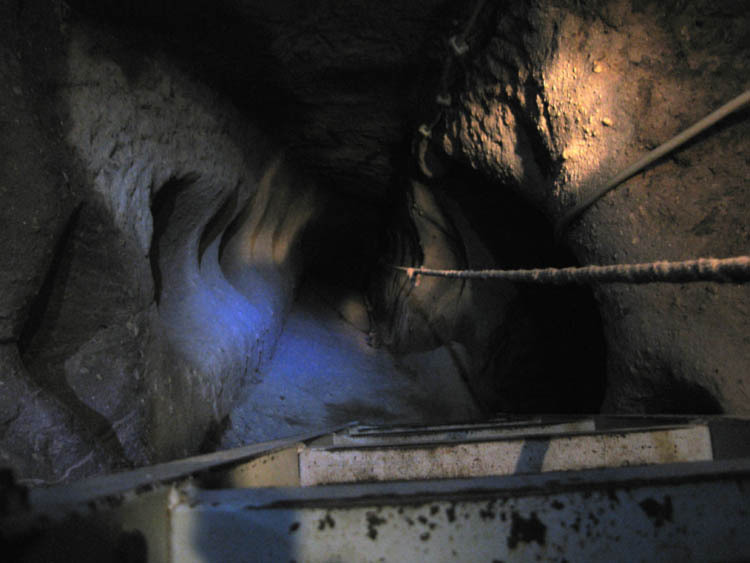 There are ventilations shafts running up and down further than our lights can see. The round stone doors that roll in place to block passageways from enemies. There are footholes on each side every foot, so climbing up is just a matter of wedging your self in and going up. Fear of heights isn’t much of a problem because there’s nothing to see when you look down. This adventure was just missing the Indiana Jones theme song in the background. After a few shafts, a knee height tunnel or two and the promise of no more “surprises”, we made it safely outside again. Now we just need to find a laundry service. Our first big hike in Goreme took us through Pigeon Valley where we came across a 4 story building carved into the hill that we couldn’t resist. We wandered the first two floors which are completely covered in pockets such that the place looks like a library. 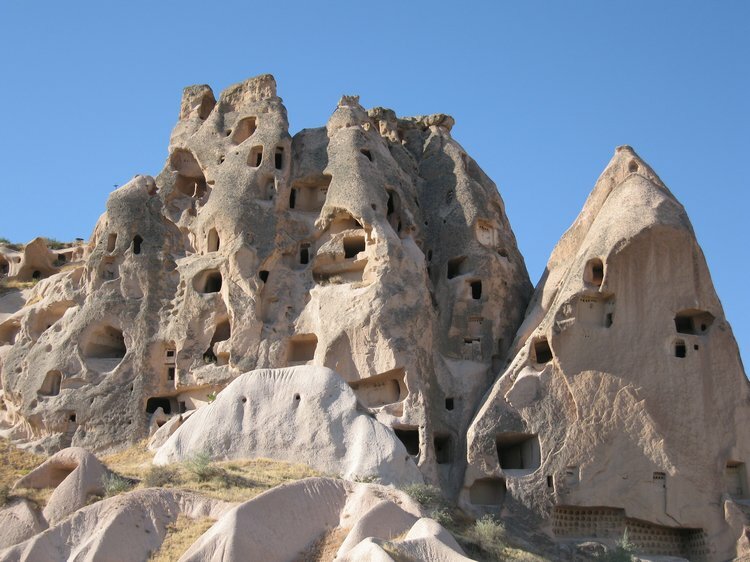 We later learned that people here raised pigeons to eat, make fresco paint from the eggs, as message carriers, and used their guano for fertilizer. 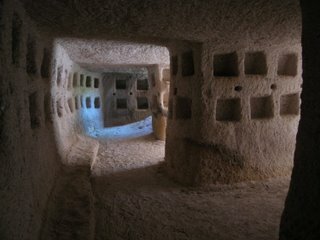 A bit later we came across this building which is a giant tufa cone of swiss cheese chambers and passageways. It is some kind of apartment or group dwelling that we called the Penthouse. The real beauty of this whole area is that there are no park rangers or signs that say “don’t go here”. Everything is open to be explored if you can get to it. That said, we wandered through hundreds of rooms going all the way to the top eight stories up, but still saw maybe only a third of it. At the end of the day, we’re tourists. 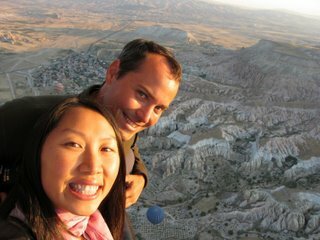 And the #1 tourist thing to do in Cappadocia is to wake up at 5am for a hot air balloon ride. There are about 15 balloons that take off each morning in neighboring fields carrying three or four hundred people. 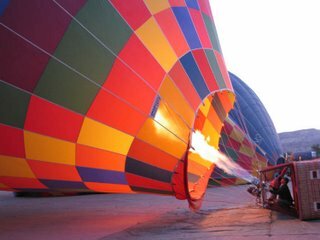 The crowds are forgotten very quickly as we watch each balloon fill up with its massive bunsen burners. What can we say, we’re both fans of flame and we got our fill this day. 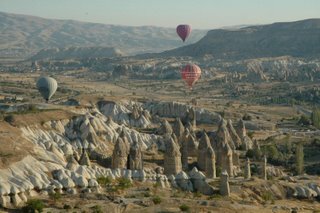 Once in the air, we saw the expected incredible views of Goreme and the surrounding valleys and town s. We quickly moved right up next to one of the couple hundred foot tall tufa cone apartment buildings and then ran up to about 4500 feet above ground level. Then we drifted over town and out towards a few valleys and our landing site. The pilot had some creative ideas about landing, though, and three times sent the ground crews running across vineyards only to take off on them and drift across another valley. Bad for them, good for us! 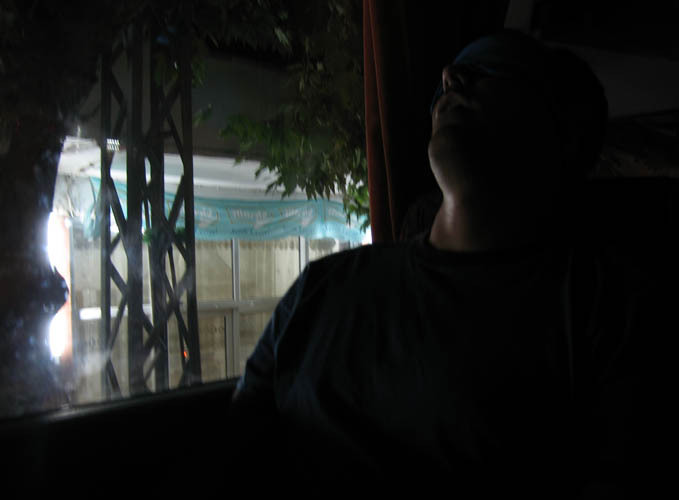 We were introduced to overnight buses in Morocco and Greece had their fare share of long rides, but I think the Turkish were born on buses. Before we leave Turkey we will have spent 120hr+ on long hauls rides. Many were overnighters that range from 8-17hr journeys. They’re not fun but it’s the best way to get around this country. After tossing your bag in the storage compartment below, hoping desperately that it’ll be there when you arrive, you’re directed up the stairs to your assigned seat. The bus quickly fills up because there is no such thing as an empty seat. Usually children sit on laps to avoid being charged an extra fare. When seats are oversold the extras are given plastic stools to c rouch on in the aisles. Shortly after departing, a steward comes by and offers a beverage and a packaged snack followed by squirts of lemon disinfectant for your hands. Throughout the night you stop to drop-off or pick-up passengers at what seems like the side of the road in middle of nowhere. Just when you start dozing off the lights suddenly come to life for the hourly stops for a snack break, toilet break, smoking break, or tea break. Sometimes they’ll slow down so the steward can unceremoniously flail the plastic bag of trash out the side door. Turkey’s very 3rd world in the way they treat their rubbage. The only way we’re able to get any sleep on the overnighters is to tire ourselves out during the day then try to block out the world with earplugs and eyeshades. Even then we’re lucky to get four hours of sleep regardless of the length of the journey. At some unreasonable hour of dawn they wake you up and toss you and your bags off the bus to let you know you’ve reached your destination, leaving you to figure out the next step half asleep and aching for a chiropractor. 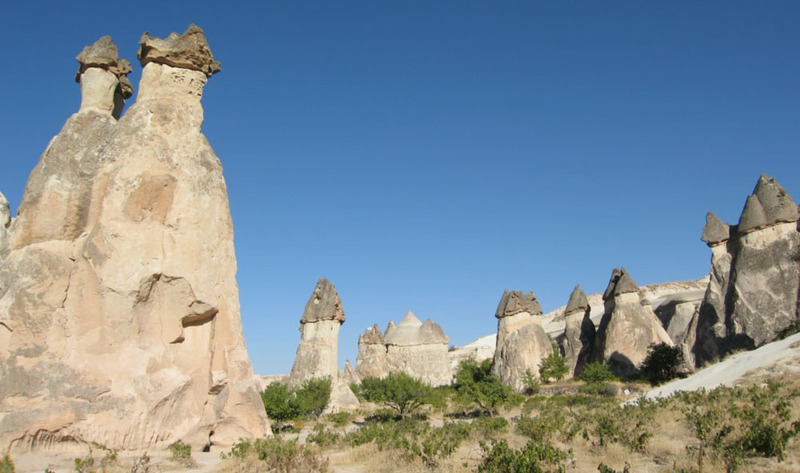 Eastern Turkey has been full of historical and religious significance. We saw the Tigris and Euphrates rivers in Mesopotamia, gazed up at the fortress where Abraham was flung down by God to land in a bed of roses, smacked our lips over the sacred carp but didn’t dare try to catch them for fear of going blind, and smelled feet in the tiny underground cave where the prophet Job spent seven years and I can’t recall what else. Most of this stuff is really wasted on us, but the stories make looking at rubble and holes in the mountains much more interesting. There’s really too much to remember and take in; it’s a real bummer there’s no cliffnotes for the Kuran. The closest thing we found is a book titled “The Crisis of Islam”, which Steve had to read very discretely given present company. Bummer I have a really poor net connection and we need to catch a boat so the rest of the pix must wait. 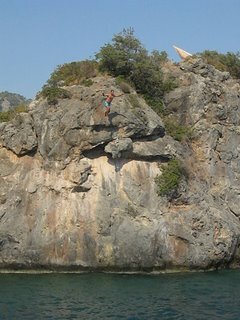 We are jumping now onto a 4 day sailing cruise along the coast from Olympos to Fethiye. 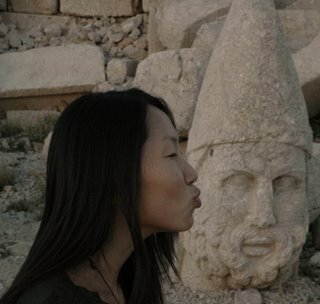 We spent about a week running right along tense borders in the east and south of Turkey: Armenia, Iran, Iraq and finally Syria. Even more tense is the mood in this part of Turkey because it is where the Kurdish separatists call home. Yeah, those Kurdish separatists who keep bombing the tourist areas of Turkey. The military checkpoints actually got a little tiring after a while as they mean extra time on the bus. The trip from Doyugabazit to Van, through Batman to Diyabakir, off to Mardin and then to Urfa, Harran and Mt. 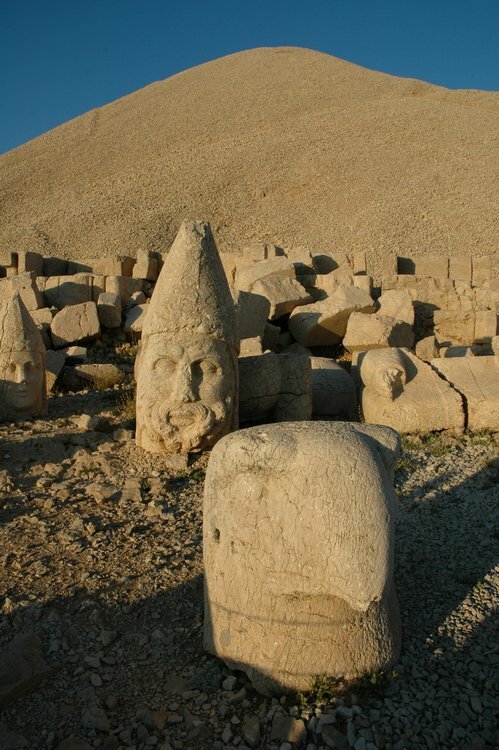 Nemrut was through the frontier and agricultural heart of Turkey. People tended to be very friendly, if for no other reason than the curiosity of passing Americans. 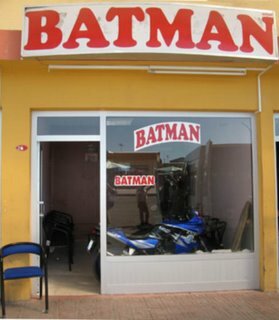 Batman: İ don’t need to make this stuff up. There’s really a town named Batman. We just passed through, but long enough to note that the bus station looks a lot like the Hall of Justice. Really, it was quite funny. But the bus didn’t stop there so no picture I also wasn’t fast enough to get a picture of the Batman ambulance we saw in Diyarbakir. Gotta be quicker with the lens. The picture here is from a bus company in the next town advertising service to Batman. My Shoe, Part 2: I tore the leather out of the sole of my sandals hiking in the Kackar mountains last month. Mary fixed it up with some twine and that kept me going until Diyabakir. A rug salesman noticed the repair and as his opening line said something to the effect of “nice to see there are Americans as poor as we are”. 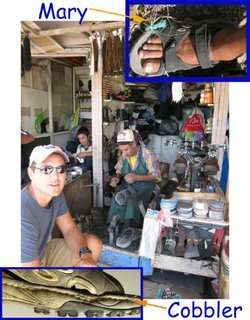 Not 10 minutes later, we stumbled across a row of cobblers and gave one a chance to disguise my poverty. The bottom picture is the stitching that resulted. That was a couple weeks ago and it’s still holding strong. Pay attention Merrell!. Home cooking:We’ve become really tired of Turkish food. It’s good and all, but after a few weeks we very much craved anything else. 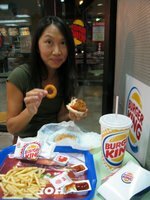 Luck came in the form of a Burger King in Diyarbakir. There’s no two ways to look at it. We had two meals in the town and both were Burger King. And they weren’t small meals. We gorged. Now that we’re back in civilized Istanbul, this process is out of control. We’ve already had Slotchkey’s Deli, Pizza Hut and McDonalds (twice).